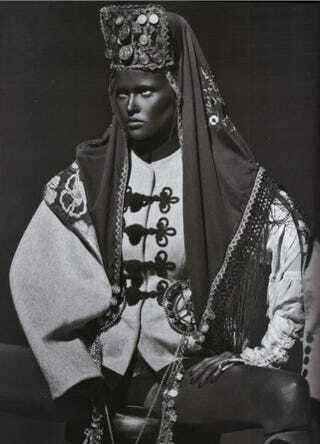 Seeking ever edgier territory, having dispensed with motherhood and cannibalism as sources of controversy, Vogue Paris took pictures of Dutch supermodel Lara Stone in blackface. Stop me if you've heard this one before! In the October issue of the magazine is a 14-page editorial featuring the Dutch beauty. Shot by Steven Klein and styled by editor-in-chief Carine Roitfeld, the piece starts off by praising Stone's "sensual" body, her "uninhibited gappy teeth" and the "radical break with the wave of anorexic models" that she supposedly represents. Too bad they changed everything they claim to love about her for the shoot. What Klein and Roitfeld should know — as the producers of the Australian programHey, Hey, It's Saturday also should have known — is that painting white people black for the entertainment of other white people is offensive in ways that stand entirely apart from cultural context. France and Australia may not have the United States' particular history of minstrel shows as a form of popular entertainment going back to the 19th century, but something about the act of portraying a white woman as black ought to sound an alarm, somewhere. The fact that the issue, dedicated to "Supermodels," contains no black models, should also have been noticed, and corrected. Given Klein is American, it would be nearly impossible to even argue that the magazine didn't know what buttons it was pushing. It's kind of sickening to think that minstrelsy has become just another "reference" for po-mo fashion editorials to "appropriate" to show how "edgy" they are, "conceptually." After painting Stone's body brown, the makeup artist then apparently painted parts of her white again. Inexplicably, the editorial moves from the studio to a location. The token Lady Gaga picture at least clears up one troubling question: why it is that Stone spends the editorial wearing only a black thong on her lower half. I looked at this editorial, and I just thought, pathetic, pathetic, pathetic. When I got to this shot, I thought lame. Since when does Carine Roitfeld seem so out-of-date? In forgetting the G on the cover, Vogue invited at least this one joke: voué à l'échec.